I told you I couldn’t stop. A donut piñata, donut balloons and now? 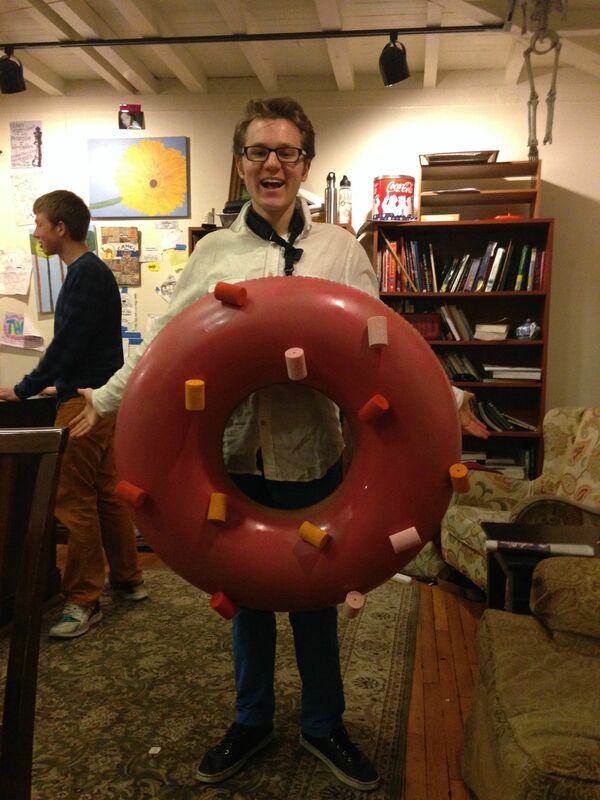 A donut costume! Because costumes based on food are the best kinds of costumes. And donuts are the best kind of food. Are we clear here? This big ol’ donut is actually the easiest thing to make, as long as you can point a can of spray paint in the right direction and use a hot glue gun. You can also make a donut hole treat bucket, if you like to take the theme all the way like I do. Let’s do this! First you’ll need to spray paint your inner tube. To prep it, inflate it and then wrap a piece of painter’s tape around the valve to protect it. Lay down a large tarp or other protective surface in a well-ventilated area and spray paint the entire tube (one side at a time). Let dry completely. Then spray paint your frosting! I don’t have photos of this because it took me a few tries to get the process right, but here’s the scoop! Cut a circle out of poster board that is slightly larger than the center hole of your inner tube. Lay it inside the top side of your donut (this will prevent the paint from covering the entire top surface). Use your frosting color to spray paint the icing on. If you want a harder line like you see here, use a scrap (curved) piece of poster board as a guide and move it around the outer edge of your donut as you spray paint. Let dry. While that paint is drying, go ahead and spray paint your foam curlers. I found the best way to do this was place them in a box (they move around a bit if you have a high pressure spray paint) and just go to town with the spray paint on them. Let dry, then touch up any sides/spots you may have missed. Once everything is dry, use your hot glue gun (preferably on a low heat setting) and hot glue your sprinkles randomly on your donut. To finish your costume, you need to make it wearable! The best way I found for this was to tie a piece of twine around the valve. Then, I tied on a long piece of ribbon. I tied the ribbon messenger strap style onto my niece Quinn in these photos and it worked well. Depending on the age of the child, you could also make a neck strap and/or waist strap, just please be careful with that if this is for a small child! We don’t want to create a choking hazard. To make the “donut hole” treat bucket, spray paint your bucket the same donut hue. Let dry, then hot glue on a few (or a ton of) sprinkles. Remove the plastic handle and add ribbon instead. Done! Wouldn’t it be fun to have a group of friends wear these in all different colors?? Yes!! DONUTS!!!! Guys, I have so many more donut DIY ideas. Don’t worry, I’m doing my best to exercise self control. But I really do hope I see a bunch of you guys (or your kiddos) walking around as donuts this Halloween! An army of DONUTS! YES! Remember Quinn’s costume last year? A macaron! Told you, I’m all about the food costumes. This makes me so happy! I wonder if an adult can pull it off hah! Food costumes are the best costumes! Oh my! I absolutely love this – best Halloween costume I’ve seen so far this year. And the foam hair curler ‘sprinkles’ are genius, by the way! This is hilarious! I love it! I really must remember this for the next office party 🙂 Thanks so much for this wonderful idea! Ok. This is just about the cutest thing I have ever seen! Where was this donut costume when I was little! Kelly! This is amazing! I love it so much!!!! Love this costume! Where did you find the pool inner tube? Help! I am doing this for this Halloween. What paint did you use? I used RustOleum for Plastic but it wouldn’t dry (it’s been a week!). I just reordered and will try RustOleum for Vinyl (didn’t know that existed) but I would appreciate any pointers… Super cute costume. Thanks! Hi Melinda! So sorry you’re having trouble with the spray paint, it is definitely tricky! I used Montana brand spray paint and it did take a good 24 hours+ to dry. Another thing you can try id spraying the inner tube with a spray primer (let dry completely) and then spraying your paint colors on top. Make sure you are spraying thin, even coats too. Make sure you let it dry outside in a well ventilated area. I hope that helps!! Thanks so much for the instructions. My costume worked out great and I got a ton of complements! Where on Earth did you find a beige inner tube? Please help I LOVE THIS and would really like to make one. I don’t think spray paint could cover an entire inner tube as nicely. How did you attach the donut to the child to wear? What color and brand of spray paint did you use? Hello blogger, do you monetize your studiodiy.com ? So simple but yet such an effective little costume! Love donuts and certainly a great idea for next Halloween!